Overjet is when the upper front teeth or jaw is excessively ahead of the lower teeth. This condition may be the result of poorly aligned teeth or poor jaw alignment. This can lead to inadequate ability to chew foods and lead to excessive tooth wear on the back teeth. 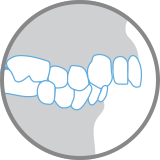 Crossbite can occur when the upper and lower teeth or jaws are misaligned. It causes one or more upper teeth to bite on the inside of the lower teeth. 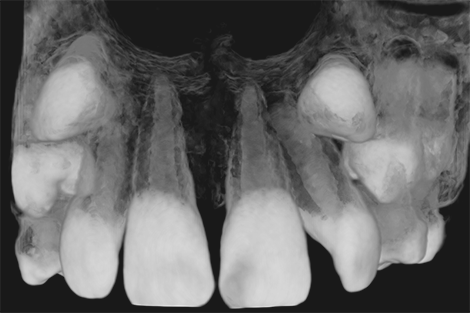 This can cause wear of the teeth and/or asymmetrical growth. 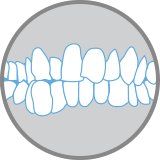 Overbite is when the upper teeth excessively overlap the lower front teeth. This usually results in early and rapid wearing down or chipping of the lower teeth. Additionally, a deep overbite can damage your gums and cause gum recession or loss of tooth supporting structures. Underbite can occur when the lower teeth protrude past the upper front teeth. This can prevent the normal function of the front teeth and cause excessive wear on the remaining teeth. It can also cause painful jaws and joint problems. Teeth crowding occurs when there is simply a lack of room within your jaw. When left untreated, overly crowded teeth can get worse. 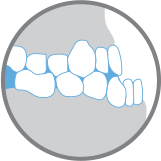 Dental crowding can make cleaning difficult and lead to plaque accumulation and tooth decay. 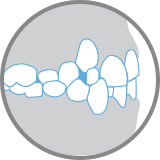 Spaces between the teeth may be from missing teeth, large dental arches or genetically small tooth sizes. In some cases, spaces may be only affecting the aesthetics of the smile. In other cases the spaces create a poor biting or chewing relationship between the upper and lower teeth. Missing teeth often result in collapsed and severely compromised bites. An impacted tooth is one that fails to erupt into the dental arch. Because impacted teeth do not erupt, they should be extracted or exposed surgically. Most often, the cause of impaction is crowding or the abnormal eruption path of a tooth. Wisdom teeth and cuspids are the most commonly impacted teeth. 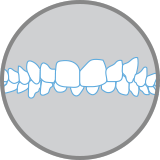 Orthodontics is used to make adequate space and guide the eruption of the tooth into the dental arch. Missing teeth may arise from genetic variation in tooth numbers or the loss of a tooth from an accident or decay. 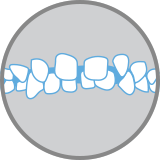 The most common genetically missing teeth occur in the smile zone of the upper arch and adversely affect the chewing function and esthetics of the smile. Loss of a permanent tooth can lead to a collapsed bite which compromises the health of many adjacent teeth. Sleep apnea is a type of sleep disorder characterized by pauses in breathing or infrequent breathing during sleep. Obstructive sleep apnea (OSA) is the most common type of sleep apnea and is caused by obstruction of the airway. Custom oral appliances can be made to posture the jaw and open the airway to effectively reduce apnea, eliminate snoring, and increase quality of sleep. Commonly people use the term buck teeth to convey the excessively protruded position of the upper front teeth. In dental terms we call this Overjet. This condition could be the result of poorly positioned teeth or a jaw imbalance. Inadequate biting relationships between the upper and lower teeth can lead to excessive tooth wear, chipping or breaking of teeth, gum recession, gum disease, and jaw or joint pain. Poor occlusion, biting relationships, can also affect chewing and over all health through compromised digestion processes. Accelerated wearing down of teeth not only creates abnormal short teeth cosmetically but can also result in severe mobility or loss of teeth. Many times this occurs because teeth hit incorrectly or there is a grinding or clenching habit present. A panoramic x-ray or “Pano” is an image of the patient’s upper and lower jaws. It shows a two-dimensional overview of all the teeth, jaws and aids in seeing conditions like crowding and impacted teeth. 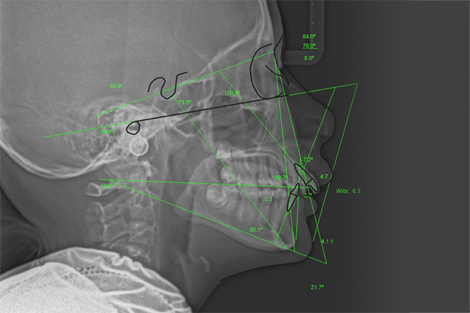 A ”Ceph” is a special x-ray taken by orthodontists to analyze the dental and skeletal relationships of the face for the purpose of critical diagnosis and treatment planning. 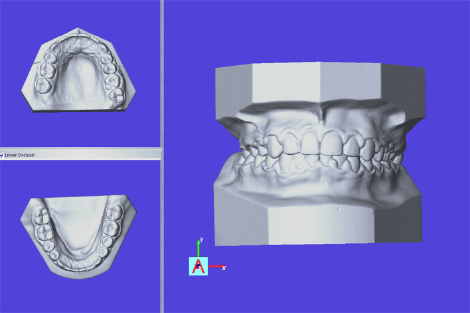 Our robotic 3D laser scanner allows us to create digital study models of our patient’s dentition. This superior technology gives us the advantage of evaluation and manipulation of the teeth in all 3 dimensions of space for diagnosis and treatment planning. 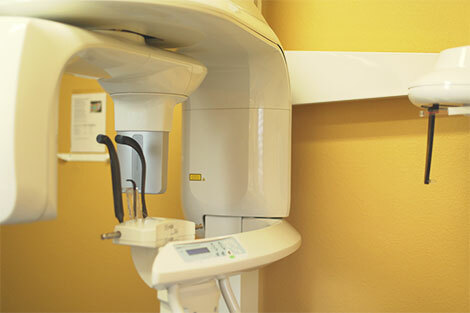 3D Cone Beam Imaging shows much more than 2D or “flat” x-rays. This new technology is truly amazing and provides more complete visual information to study a case from every angle and zoom in as close as a micron.